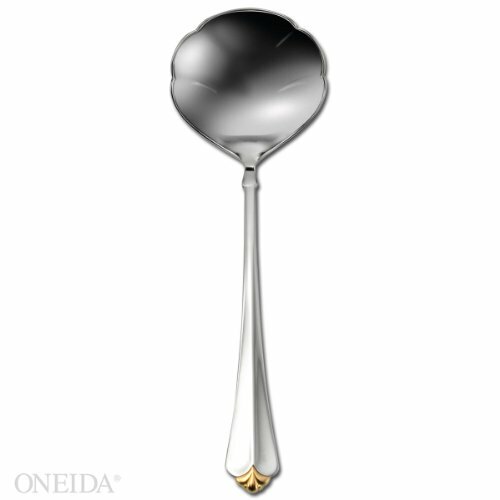 Oneida's Golden Juillard is regal, refined and rich. This entertaining essential takes the popular Juilliard pattern and dresses it up in 24K gold for a dazzling dining presentation. 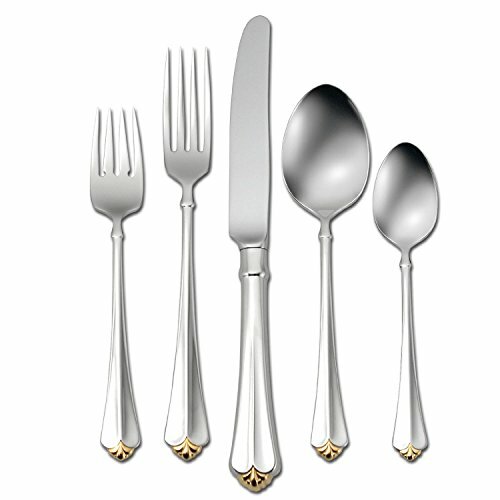 Pair this dressy flatware design with gold banded dinnerware for festive holidays and special occasions. Graceful and slender, this set is a bright shining statement of style. 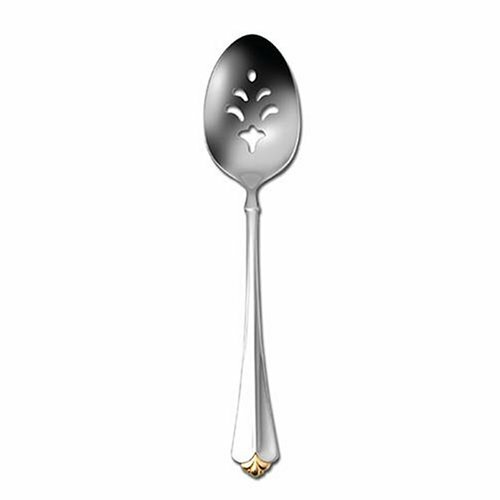 The pattern has a sculptured handle with a 18 Karat gold trefoil detail at the tip end. At the narrow point, a small, embossed ridge adds yet another detail to its fine touches. Golden Juilliard resonates from top to bottom with traditional grace. This popular pattern is accentuated with a crisp, 24 karat gold electroplate fleur-de-lis. Great for family dining or entertaining, combining durability with a lustrous finish. 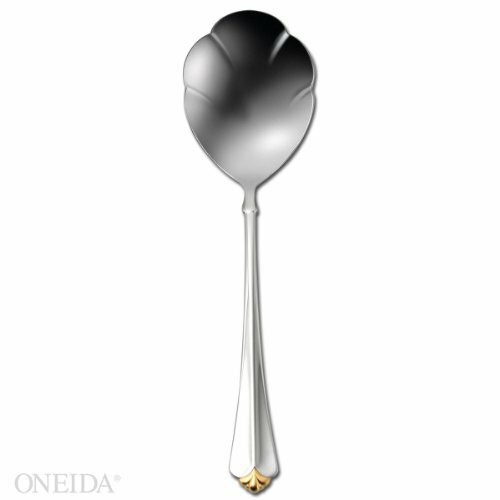 Oneida, the leading name in flatware, has been setting tables for generations. 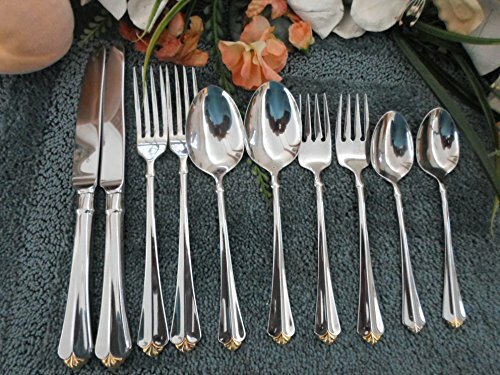 Full service for 1, this 5-piece place setting includes a teaspoon, place spoon, place knife, place fork and salad fork. The dinner fork is the universal tableware piece for entrees. Can also be used as a dessert fork. 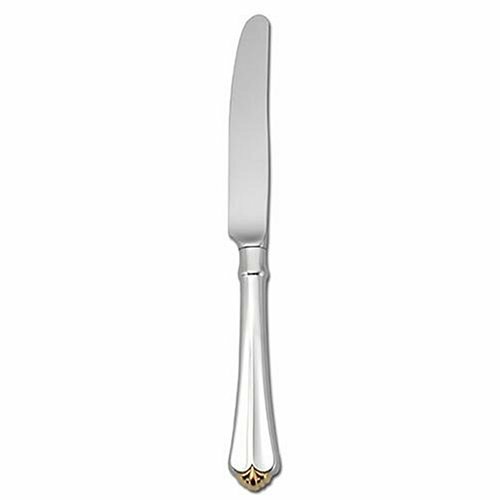 This dinner knife is necessary on any table setting. 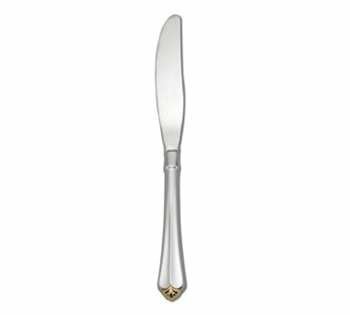 It serves equally well as a butter knife, break knife, or dessert knife. 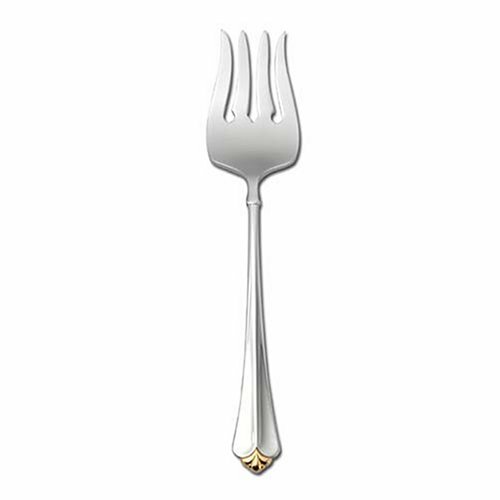 This salad fork is the most versatile fork you can own. Use it for salads, pies, cakes, pastries, fruits and fish. This sugar spoon is a multi-purpose server! Ideal for jellies, jams, condiments, sauces as well as for sugar. Golden Juilliard resonates from top to bottom with traditional grace. This popular pattern is accentuated with a crisp, 24 karat gold electroplate fleur-de-lis. Great for family dining or entertaining, combining durability with a lustrous finish. Oneida, the leading name in flatware, has been setting tables for generations. 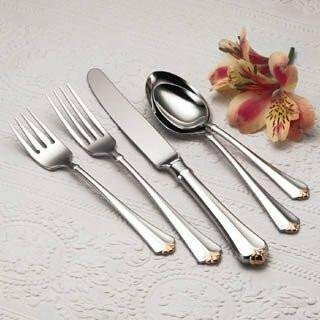 Oneida's highest quality stainless flatware, the 3-piece serving set includes: large serving fork, butter knife and pierced spoon. 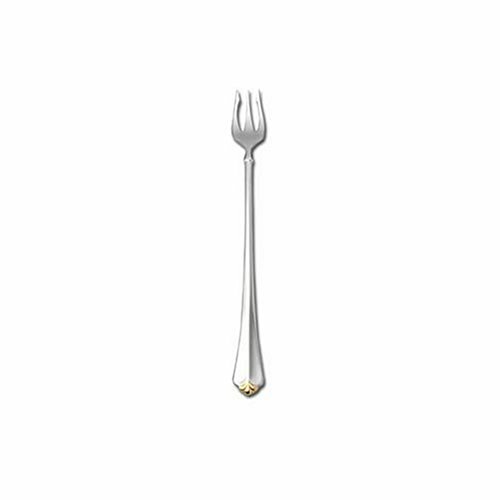 This seafood fork is used for seafood cocktails, fruit cocktails, lobster, antipasto and for serving hors d'oeuvres. It can also be used as a pickle fork. 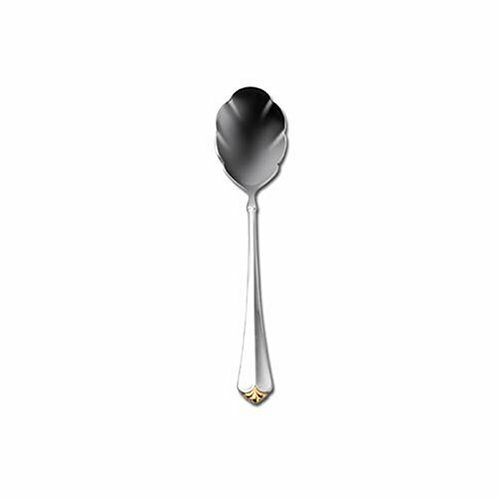 This table serving spoon is used for vegetables, fruits, casseroles, and stuffing. 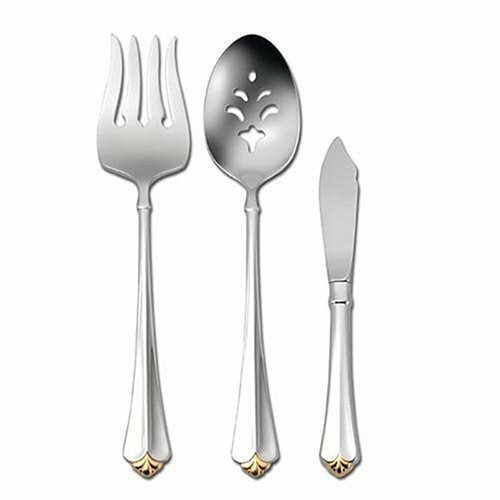 Can also accompany the serving fork to dish out your favorite salads. 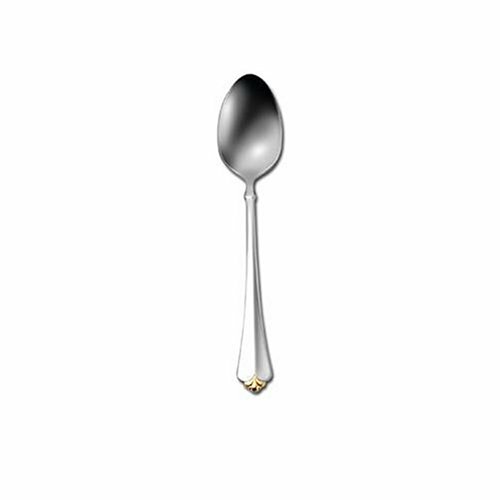 This pierced table serving spoon is used for vegetables, fruits, casseroles and other dishes served in their own juices. This serving fork is used for cold meats, cheese slices, chops, waffles, sliced tomatoes, spaghetti and many more! Match is up with the serving spoons for a salad set. 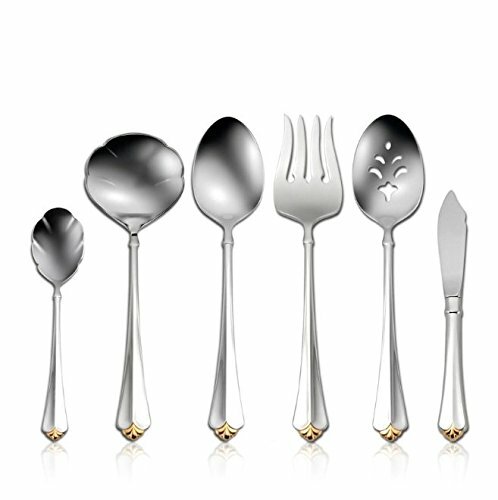 Compare prices on Oneida Golden Juilliard at LiveSaler.com – use promo codes and coupons for best offers and deals. We work hard to get you amazing deals and collect all avail hot offers online and represent it in one place for the customers. Now our visitors can leverage benefits of big brands and heavy discounts available for that day and for famous brands. We try to makes comparison shopping easy with Product Reviews, Merchant Ratings, Deal Alerts & Coupons. Find Deals, Compare Prices, Read Reviews & Save Money.